书籍简介: \\\\\\\\\\\\\\\\\\\\\\\\\\\\\\\\\\\\\\\\\\\\\\\\\\\\\\\\\\\\\\\\\\\\\\\\\\\\\\\\\\\\\\\\"A well-organized compendium of immense common sense. [The authors'] values-based, walk-the-talk approach recognizes the fast-changing environment we live in. It shows the importance of aggregating and integrating knowledge and experience on a continuing basis. Finally, it demonstrates the significance of creating a culture that reinforces those values and takes pride in thriving on the complexity.\\\\\\\\\\\\\\\\\\\\\\\\\\\\\\\\\\\\\\\\\\\\\\\\\\\\\\\\\\\\\\\\\\\\\\\\\\\\\\\\\\\\\\\\"
\\\\\\\\\\\\\\\\\\\\\\\\\\\\\\\\\\\\\\\\\\\\\\\\\\\\\\\\\\\\\\\\\\\\\\\\\\\\\\\\\\\\\\\\"The Aggregate System is a powerful blend of strategic formula, exceptional culture, and human systems combined into a complete self-perpetuating system to produce exceptional performance. Anyone interested in improving the performance of his or her company should read this book.\\\\\\\\\\\\\\\\\\\\\\\\\\\\\\\\\\\\\\\\\\\\\\\\\\\\\\\\\\\\\\\\\\\\\\\\\\\\\\\\\\\\\\\\"
\\\\\\\\\\\\\\\\\\\\\\\\\\\\\\\\\\\\\\\\\\\\\\\\\\\\\\\\\\\\\\\\\\\\\\\\\\\\\\\\\\\\\\\\"This is not another 'silver bullet' piece of academic advice on how to do a quick fix to some imaginary business. 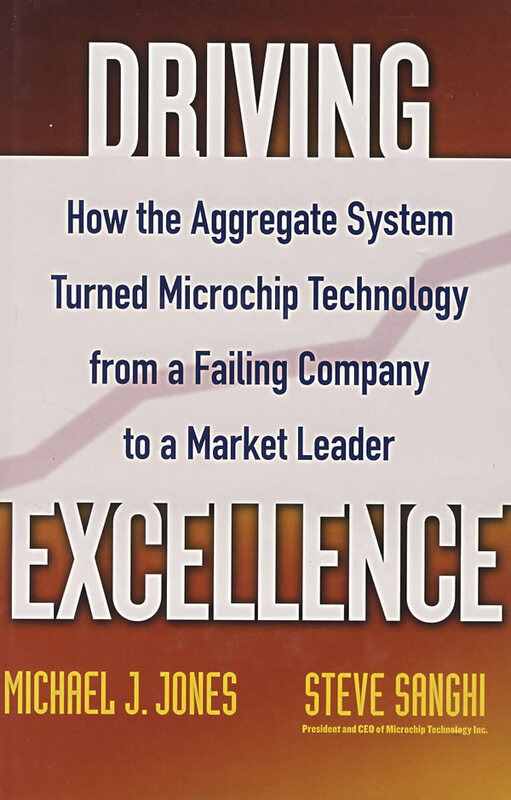 Driving Excellence is a serious and detailed insight into how a real CEO, Steve Sanghi, has transformed a real company, Microchip, into a world-class enterprise. Anyone interested in understanding the realities of implementing and sustaining an enterprise-wide constant improvement plan should read this book.\\\\\\\\\\\\\\\\\\\\\\\\\\\\\\\\\\\\\\\\\\\\\\\\\\\\\\\\\\\\\\\\\\\\\\\\\\\\\\\\\\\\\\\\"
\\\\\\\\\\\\\\\\\\\\\\\\\\\\\\\\\\\\\\\\\\\\\\\\\\\\\\\\\\\\\\\\\\\\\\\\\\\\\\\\\\\\\\\\"Driving Excellence is the first book to deal with the integration of all the core elements that are essential to running a business. It should be required reading for all executives and venture firms looking to boost return on invested capital and add some consistency to their growth. High praise is due to Michael Jones and Steve Sanghi for developing a blueprint that works in the real world.\\\\\\\\\\\\\\\\\\\\\\\\\\\\\\\\\\\\\\\\\\\\\\\\\\\\\\\\\\\\\\\\\\\\\\\\\\\\\\\\\\\\\\\\"
\\\\\\\\\\\\\\\\\\\\\\\\\\\\\\\\\\\\\\\\\\\\\\\\\\\\\\\\\\\\\\\\\\\\\\\\\\\\\\\\\\\\\\\\"This book provides a nicely developed framework to understand organizational effectiveness and performance, drawing upon Sanghi's managerial skills, perfected in his significant turnaround performance at Microchip. Importantly, the reader benefits from insight and experience about building an organizational culture productive to performance and competitiveness.\\\\\\\\\\\\\\\\\\\\\\\\\\\\\\\\\\\\\\\\\\\\\\\\\\\\\\\\\\\\\\\\\\\\\\\\\\\\\\\\\\\\\\\\"
Steve Sanghi is the President, CEO and Chairman of the Board of Microchip Technology Inc. Under his leadership Microchip became the top IPO of 1993. Steve holds a MS in Electrical and Computer Engineering from University of Massachusetts and BS in Electronics and Communications from Punjab University, India. In June 1995 he received an Arizona Entrepreneur of the Year Award and was a finalist in the National Turnaround Entrepreneur of the Year category. Steve co-chairs the State of Arizona Governor’s Council of Innovation and Technology, and is a member of the Board of Trustees of Kettering University in Flint Michigan. His media appearances include: CBNC Squawk Box (May 05’) and Mad with Money, Jim Cramer’s show; Bloomberg TV and radio, quoted in the WSJ and more.